Mamelodi Sundowns coach Pitso Mosimane is looking to put a lid on expectations after their record-breaking 5-0 win over Egypt's Al Ahly catapulted the South African club into a favourites' role in this season's African Champions League. Sundowns might have won by a more handsome margin, such was their dominance in the first leg of their quarter-final tie against the Cairo giants, who are African football's most successful club having won a record eight titles in the continent's top club competition. The 5-0 win on Saturday easily broke the record for previous heaviest defeat for Ahly in African club competition - a series of 3-0 losses including the second leg of last year's final against Esperance of Tunisia. It was also their heaviest defeat since losing 6-0 to arch rivals Zamalek in the 1942 Egyptian Cup final, some 77 years ago. But Mosimane sought to temper the home excitement after a near capacity crowd at the 45,000-strong Lucas Moripe Stadium in Atteridgeville, on the outskirts of Pretoria, watched as his team picked apart the Egyptians. "We do not want to talk a lot. We have to show respect. 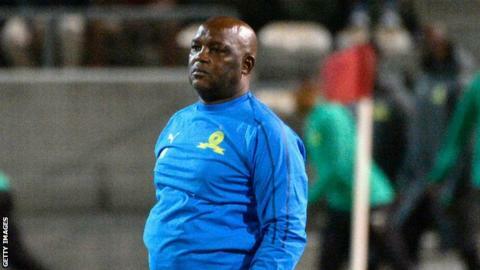 This is a big coach with a big CV," Mosimane said of his counterpart, Uruguayan Martin Lasarte, whose future at Ahly is now under a dark cloud. "If he puts his CV here and I put mine, I will have to hide mine under a table. I know that losing 5-0 is hard. Let's show humility and respect," Mosimane added. The South African coach, formerly in charge of the national team from 2010 to 2012, is known for his thorough preparation and put the one-sided result down to the homework he and his technical team did since last month's draw pitted them against Ahly. "We watched eight games of Al Ahly," he explained. "The last two were against Pyramids and Zamalek. "We got the patterns, how they play. We did our homework. It wasn't luck. We worked for it. We knew all their danger areas, all their danger men," he added. Lasarte, a former La Liga coach with Real Sociedad who has been in the Ahly job just a handful of months, was contrite after the game. "We have certainly played a bad game, and we need to work in the upcoming period," Lasarte said at the post-match news conference. "I would like to send a message to the Al Ahly fans who attended the game in South Africa, as well as the ones who watched the game on TV. We are sorry. "We are embarrassed and apologise to you. There is nothing else to be said. We will talk less and work more from now on," he added. The return leg is in Suez next Saturday but before that Ahly must play Misr El-Makkasa in the Egyptian Premier League on Wednesday. Ahly's hectic schedule as they catch up on domestic fixtures postponed earlier in the campaign is being blamed for their tired-looking showing in Pretoria.